Against the backdrop of strong economic movement of Vietnam and the world, glass is becoming a popular material in the central treadmill of construction works. Adopting innovative thinking, challenging difficulties and grasping new trends, Sado Group has become the first brand in Vietnam to have a world-standard glass and aluminium glass production factory, which is situated in Tam Phuoc Industrial Park, Bien Hoa City, Dong Nai Province. The over VND500-billion glass factory is the sole unit in Vietnam to manufacture glass with absolute sound insulation and standard heat insulation. The products that make the name of Sado Group include tempered glass, laminated glass, sound-insulated glass, heat-insulated glass, digitally printed ceramic colour glass, decorative glass, and fire-resistant glass. All products with premium quality are tempered by advanced machinery and technologies transferred by world-renowned corporations like LiSEC, Glaston, Dip-Tech, RAPID and Benteler. Powered by Germany technologies, the glass factory of Sado Group has become the largest of its kind in Southeast Asia and is one of the most modern factories in the world. With its current scale, quality and influence, Sado Group continues to invest in human capital, equipment system and laboratory system (to research and develop new products). Particularly, Sado Group has sped up the construction of research institute in the high-tech park where three German professors and two Vietnamese professors are working. The institute of Sado Group is expected to introduce two landmark product lines in 2016 to lead the advanced glass market with coating technology and plasma technology. In addition, the group will build a test lab to test the tightness of the water, resistance capacity to wind and static load before launching products to the market. Besides, aluminium and glass products of Sado Group such as aluminium alloy doors, aluminium and glass partitions are gradually occupying the top market share thanks to outstanding quality, made from the most advanced production lines imported from RAPID Group ofGermany where the machining process is fully automated with high speed, high precision and environmental friendliness. Moreover, together with exceptional quality, advanced glass and aluminium products of Sado Group always have competitive prices. The group’s market segments are diverse in high and advanced classes. Warranty is applied at the highest level. 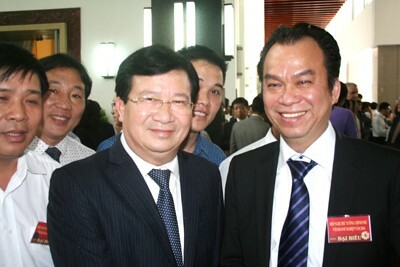 Obviously, the presence of Sado Group has helped Vietnam reduce glass import. Each year, Vietnam imports millions of square metres of construction glass. Currently, with an annual production capacity of 18 million square metres of glass, Sado Group has become a leading supplier of construction glass in both volume and quality in Vietnam. In the context of deep and broad integration, the development path of Sado Group will not just end within the boundary of Vietnam. In the coming time, with opportunities generated from free trade agreements (FTAs), particularly recently concluded Trans-Pacific Partnership (TPP), Sado Group will reach out to international markets. Above all, in May 2016, Vietnam will welcome the expected visit of the US President Barack Obama. The visit is intended to strengthen US - Vietnam relations, mark the 20th anniversary of bilateral diplomatic relations, foster cooperation measures to promote comprehensive partnership between the two countries, bring the bilateral relations to a new high, and contribute to maintaining regional stability. Mr Nguyen Cong Chinh, leader of Sado Group, said, by promoting the strategic vision and preparing development scenarios, Sado Group is committed to becoming a long-term sustainable partner of many markets, complying with business plans of every stakeholder, abiding by business laws, using up the business potential, efficiency and competitiveness of each party, constantly diversifying business activities and expanding the market. Notably, Sado Group’s path to the world has placed the first foundation when Mr Nguyen Cong Chinh was elected to the Executive Board of Vietnam Business Association in Germany (2015-2018 term). This landmark has helped Sado Group bring its advanced glass products closer to Germany and other European markets; and expand exports of highly valued products to the German market values. Recently, Schneider Bruederer, a German company, placed an order at Sado Group. In March 2016, the European Business Association (EBA) presented the Best Business Leader to Mr Chinh and recognised Sado Group as the best enterprise in the aluminium and glass sector at the Achievements Forum 2016 in the United Kingdom. In Vietnam, Sado Group has marked its success with the presence of its products in important projects, including Lam Vien Square in Da Lat City.